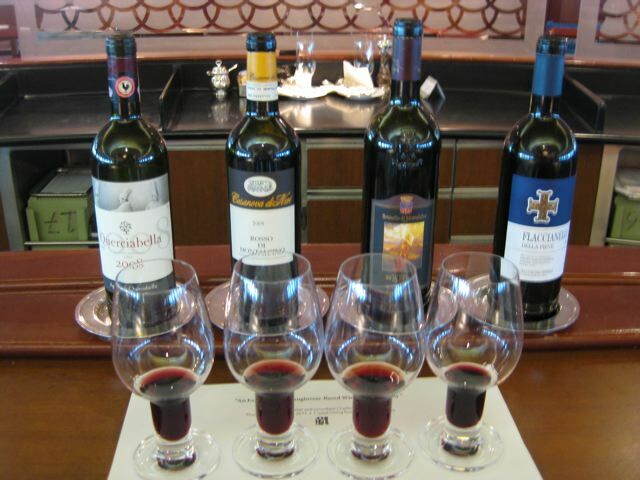 The last day at sea as the Crystal Serenity sailed toward Istanbul I taught a wine class in the main dining room entitled “Sangiovese in Tuscany.” I selected four wines made from 100% Sangiovese or mostly from that grape. Over 50 people showed up for the tasting though there were a number of other events going on at the same time. 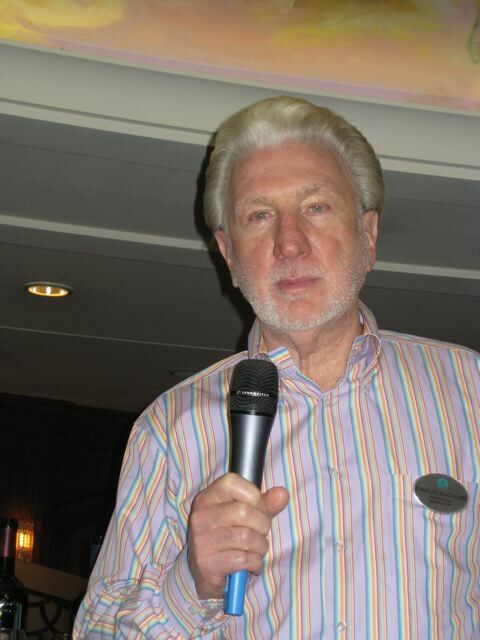 The class members asked some very good questions and made interesting comments and I enjoyed doing the class. The ship glided so smoothly through the water that the wine in the glasses was perfectly still. Chianti Classico 2008 DOCG 95% Sangiovese and 5% Cabernet Sauvignon Querciabella. Selection of the grapes takes place in the vineyard and they are destemmed and not crushed. Alcoholic and maceration fermentation take place in temperature controlled stainless steel vats. Maceration lasts for about 12 days for the Sangiovese and as much as 20 days for the other cépages. After complete malolatic fermentation the wine is transferred into barriques. The French oak comes from Allier, Chatillon, Nevers and Troncais. 10% of the Sangiovese is in new barrels and 90% is first and second passage. 80% of the other Cabernet Sauvignon is in new barrels. There is separate aging. The wine may be aged for as long as 14 months. Then the best lots are selected to create the final blend. The wine is released around 18 months after the harvest. 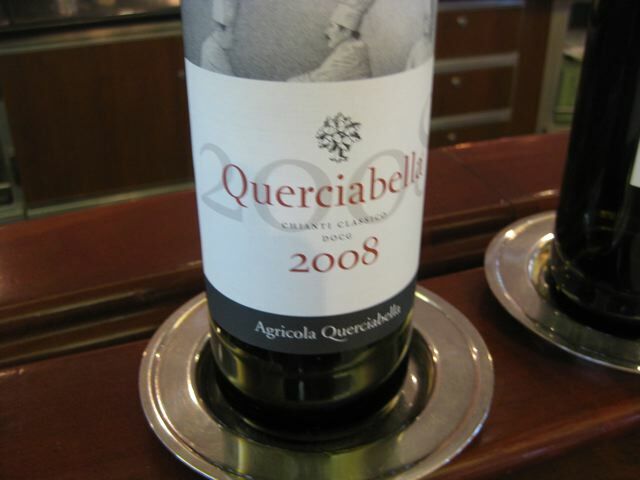 Querciabella has been organic since 1988 and Biodyamic since 2000. They use no animal products or by-products and therefore the wine can be drunk by vegetarians and vegans! The wine has red berry aromas and flavors with hints of cherry and a touch of violet. 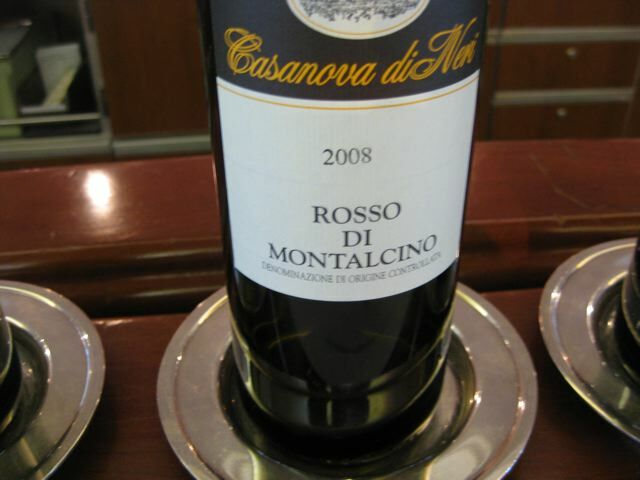 Rosso di Montalcino 2008 DOC 100% Sangiovese Grosso Casanova di Neri The harvest took place from September 19 to October 9th. The grapes are harvested by hand and are inspected on a sorting table. A machine removes the stalks from the grapes, which then drop on to another sorting table. The selected grapes are taken by gravity to tanks where the vinification process takes place. Fermentation and maceration lasted for 18 days. It is aged for one year in wood. The wine was bottled on the 9, 10 and 11 of November 2009. It has red fruit aromas and flavors with hints of ripe cherry. The soil is a yellowish brown color, calcareous sandy top soil with many rounded stones. The training system is spurred cordon and there are between 2,400 and 4,400 vines per hectare. After a careful grape selection the grapes are vinified with skin contact for 10 to 12 days. The wine is aged for 2 years in oak barrels, 50% in 350 liter barriques and 50% in 60 and 120 hl Slovenian oak casks. The wine is then aged in bottle for another 8 to 12 months before release. Banfi has done 20 years of research to come up with what they believe are the perfect clones of Sangiovese to make Brunello. 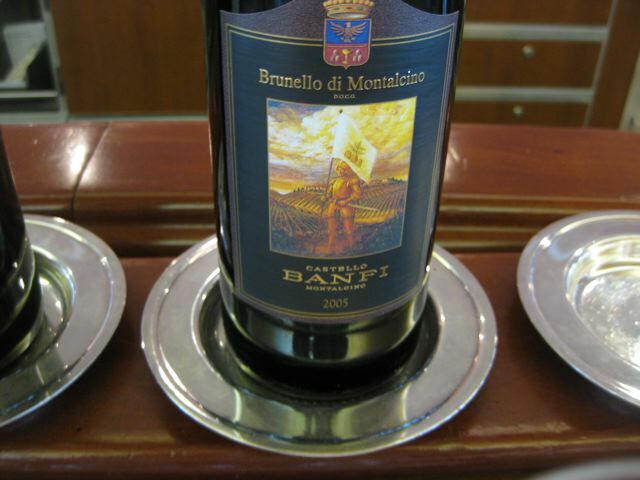 At Vinitaly a few years ago I went to a Banfi seminar on their Brunello and it was very informative. I believe they use three different clones of Sangiovese in their Brunello. This wine has red and black fruit flavors and aromas with hints of black cherry, violets and a touch of tobacco. Last year when I tasted the 2004 regular Brunello I really liked it and I am pleased to see that the 2005 is in the same style. 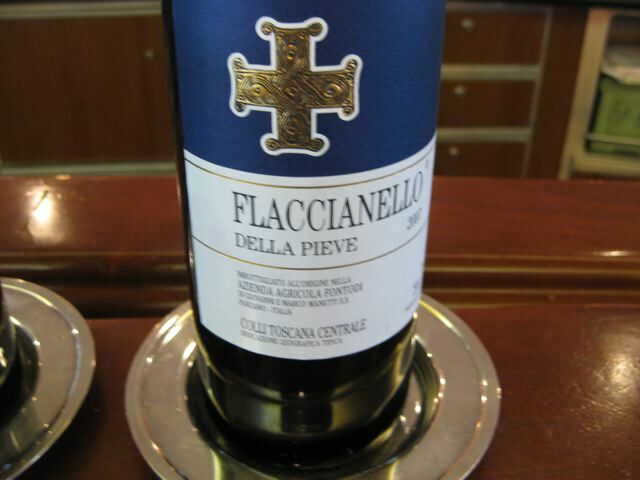 Flaccianello della Pieve IGT 2007 Agricola Fontodi 100% Sangiovese. There are 6,000 vines per hectare and the training system is Guyot. Spontaneous fermentation with indigenous yeast and maceration takes place in steel tanks with fullers and thermal control for at least 3 weeks. Malolatic fermentation takes place in oak barrels. The wine is aged in Troncais and Allier barriques for 18 months. This was the most international style wine of the four that we tasted. Ripasso from Bertaini, Tedeschi, Speri ,Tommasi or Tenuta Santa Maria alla Pieve. I like your recommendations for Thanksgiving- all excellent producers!